This cold, ready-to-eat pasta salad of pre-cooked penne with grilled courgettes/zucchini, grilled red peppers, grilled yellow peppers, sun-dried tomatoes, onions and Mediterranean dressing will go down well with everyone. Simple and tasty. 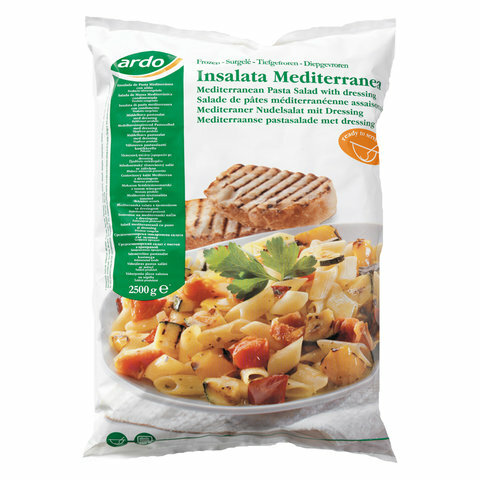 You can also give this salad a personal touch by adding tuna or ham or mozzarella... A must for anyone who loves pasta! Rapid defrosting is possible by microwave 350 W.
To defrost place the product in a refrigerator. To serve cold.